In response to numerous media scandals which exposed student cheating in Australian universities, the Australian Government Office for Learning and Teaching commissioned a research project co-led by Associate Professor Tracey Bretag and Dr Rowena Harper (University of South Australia) to explore the relationship between contract cheating and assessment design. 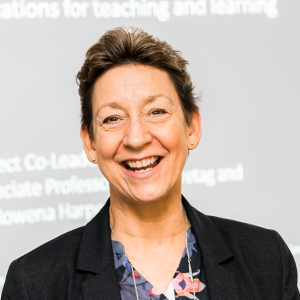 At the Studiosity Symposium in Sydney on 9 August, Tracey Bretag shared the main findings from that project and discussed the implications of those findings for teaching and learning in higher education. Contract cheating in higher education, the full presentation video by Tracey Bretag at the 2018 Studiosity Symposium [41min] (find the presentation slides at the bottom). “Contract cheating occurs when a student submits work that has been completed for them by a third party, irrespective of the third party’s relationship with the student, and whether they are paid or unpaid” (Harper & Bretag et al 2018). Students ‘share’ their work a lot, and this can lead to cheating. While only 6% of students reported engaging in one or more of the cheating behaviours under investigation, 15% of students had bought sold or traded notes, and 27% of students had shared their completed assignment with another student. Our research found that the students in the 6% ‘Cheating Group’ were twice as likely to have also engaged in ‘sharing behaviours’ and were more likely to pay money or use a file sharing website or professional service for this purpose. Despite the spread of file-sharing websites and online cheating services, students still primarily engage in outsourcing with people they know, such as current students, former students, friends and family. Three factors contribute to contract cheating: English as an additional language, the perception that there are ‘lots of opportunities’ to cheat, and dissatisfaction with the teaching and learning environment. While university teachers do not have any influence over English language requirements and admissions processes, they do have direct input to the teaching and learning environment, and can look carefully at assessment practices and processes to address any areas where students may see opportunities to cheat. Students are not concerned about contract cheating, and university staff are not talking to them about it. While staff reported being ‘moderately’ to ‘extremely’ concerned about contract cheating, both the Cheating and Non-Cheating students were similarly unconcerned. Both groups of students also reported that although teaching staff regularly discuss their institution’s academic integrity policy, they rarely discuss contract cheating, the potential damage it can do to the value of the student’s degree and to their institution’s reputation, and the very serious consequences such as suspension or expulsion which may occur if contract cheating is detected. Suspected cases of contract cheating often are not reported and when they are, the penalties are lenient. Staff told us that the three main reasons they don’t refer suspected cases to an academic integrity breach decision-maker are: The perception that it’s ‘impossible to prove’; the process is too time consuming; and they don’t feel encouraged to report. Disappointingly, despite recommendations in the literature (for example by the national regulator, TEQSA) that suspension should be the minimum penalty, staff reported that the most common outcome for substantiated contract cheating was a warning/counselling and zero for assessment. Although the project acknowledges that ‘authentic’ assessment (professionally focussed, complex, and with impact beyond the classroom) is good pedagogy and likely to engage learners, we also found that in itself, authentic assessment is not the solution to contract cheating. However, we did identify four assessment types which students reported are less likely to be outsourced. These included those that are: personalised and unique, completed in class, vivas and reflections on practicum. Unfortunately, staff told us they rarely use these assessment types due to institutional constraints and lack of resourcing. In addition to the survey responses from staff and students, the project also analysed a sample of 200 procurement requests (where students go online and request a professional ‘essay writing service’ to produce an assignment for them) and over 500 substantiated cases of contract cheating from two universities, to see if ‘authentic’ assessments were more or less likely to be outsourced. In both datasets, the authenticity of the assessment task appeared to have no relationship with contract cheating. Students outsource all types of assignments, regardless of authenticity. In one discipline (Education), ALL the procurement requests were for highly authentic assignments. The key findings of the Contract Cheating and Assessment Design Project (Bretag & Harper et al 2018; Harper & Bretag et al 2018) provide an evidence base with which institutions and educators can begin to address this egregious breach of academic integrity. The critical first step is for institutions to focus on the teaching and learning environment by adequately resourcing educators and academic integrity breach decision-makers. This will ensure that university teachers have the capacity to use assignments that are less likely to be outsourced (including focusing on reducing opportunities to cheat), and when cases are detected, appropriate and consistent penalties can be applied. Presentation: Associate Professor Tracey Bretag: Contract cheating implications for Teaching and Learning. Interested to hear more? Here are selected presentations of the 2018 Studiosity Symposium.